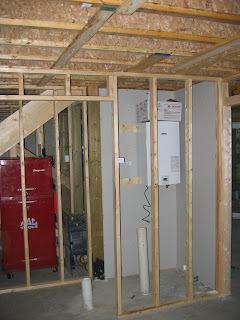 This past weekend, in preparation for the electrician, we rough-installed the tankless water heater. As you can see in the picture it requires 120v so we installed the heater early so the electrician would know were to place the outlet. At least 12 inches from the floor - we placed it just under four feet from the floor. The unit comes with a wall mounting bracket which they recommend be installed on a 3/4 plywood strip that is securely fastened to at least two studs. A second plywood strip is secured 30 inches below to ensure the heater rests exactly vertical on the wall. It is very important that the exhaust vent and air intakes can be installed between the floor joints at the proper clearance and exit locations. So we made sure that the heater was located properly in that regard. Unless you are installing your heater in a utility room, where you tend not to finish the walls with drywall, be sure to install drywall before the heater. We installed drywall on an addition wall adjacent to the tank because, although it did not have any thing to be installed on it (yet), we believed it would be difficult to install the drywall once the heater was in place. Order of building is everything! COMING: I will discuss and share my experiences in the installation of the tankless water heater in later posts.